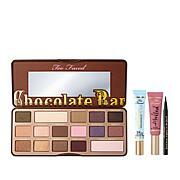 A decadent trio of giftable makeup selections with delicious chocolate colored tones. - 100% felt the mascara thickens lashes at the base and lengthens at the tip. Week 1: - 100% felt this mascara provided dramatic volume and length. - 90% felt that they love this mascara. Mascara: Apply the first coat from base to tip. Apply the second coat over and under the lashes. Apply third coat by rolling the wand from base to tip and bumping the lashes back at the tip. For best results, let your lashes dry in between coats. Ingredients: Water/aqua/eau, Synthetic Beeswax, Paraffin, Glyceryl Stearate, Acacia Senegal Gum, Butylene Glycol, Oryza Sativa (Rice) Bran Wax, Stearic Acid, Palmitic Acid, Polybutene, VP/Eicosene Copolymer, Cera Carnauba/Copernicia Cerifera (Carnauba) Wax/Cire de carnauba, Aminomethyl Propanol, Phenoxyethanol, Glycerin, Ethylhexylglycerin, Hydroxyethylcellulose, Disodium EDTA, Polyester-11, PVP, Cellulose, Trimethylpentanediol/Adipic Acid/Glycerin Crosspolymer, Propylene Glycol, Acacia Senegal Gum Extract, Potassium Sorbate, Dextran, Acetyl Hexapeptide-1. May Contain/Peut Contenir/(+/-): Iron Oxides (CI 77499), Black 2 (CI 77266), Ultramarines (CI 77007). Ingredients: Caprylic/Capric Triglyceride, Vegetable Oil (Olus/Huile Vegetale), Punica Granatum (Pomegranate) Sterols, Polyethylene, Polybutene, Diisostearyl Malate, C12-15 Alkyl Lactate, Isostearyl Hydroxystearate, Euphorbia Cerifera (Candelilla) Wax (Candelilla Cera/Cire De Candelilla), Triisostearyl Citrate, Trimethylolpropane Triisostearate, Isostearyl Isostearate, Hydrogenated Vegetable Oil, Tridecyl Trimellitate, Flavor (Aroma), Limonene, Benzyl Benzoate, Citral, Linalool, Geraniol, Hydrogenated Polycyclopentadiene, Nelumbo Nucifera Flower Extract, Ethylhexyl Palmitate, Tribehenin, Sorbitan Isostearate, Palmitoyl Oligopeptide, Phenoxyethanol, Mica; May Contain/Peut Contenir (+/-): Blue 1 Lake (CI 42090), Titanium Dioxide (CI 77891), Iron Oxides (CI 77491, CI 77492, CI 77499), Red 7 Lake (CI 15850), Red 30 Lake (CI 73360), Yellow 5 Lake (CI 19140), Red 6 (CI 15850). Ingredients: Matte Cherry Cordial, Matte Hazelnut, Matte Gilded Ganache, Matte Candied Violet, Matte Creme Brulee Ingredients: Mica, Talc, Ethylene/Acrylic Acid Copolymer, Ethylhexyl Palmitate, Sodium Saccharin, Boron Nitride, Polyethylene, Zinc Stearate, Phenoxyethanol, Poloxamer 338, Silica, Sodium Dehydroacetate, Sorbic Acid, Theobroma Cacao (Cocoa) Fruit Powder/Theobroma Cacao Fruit Powder, Vanillin, Carmine (CI 75470). May Contain/Peut Contenir (+/-): Yellow 5 Lake (CI 19140), Ultramarines (CI 77007), Iron Oxides (CI 77491, CI 77492, CI 77499), Manganese Violet (CI 77742), Titanium Dioxide (CI 77891). Matte Champagne Truffle, Semi-Sweet Ingredients: Talc, Mica, Ethylene/Acrylic Acid Copolymer, Ethylhexyl Palmitate, Sodium Saccharin, Boron Nitride, Polyethylene, Zinc Stearate, Phenoxyethanol, Poloxamer 338, Silica, Sodium Dehydroacetate, Sorbic Acid, Theobroma Cacao (Cocoa) Fruit Powder/Theobroma Cacao Fruit Powder, Vanillin, Carmine (CI 75470). May Contain/Peut Contenir (+/-): Iron Oxides (CI 77491, CI 77492, CI 77499), Manganese Violet (CI 77742), Titanium Dioxide (CI 77891). Matte Marzipan Ingredients: Talc, Mica, Ethylene/Acrylic Acid Copolymer, Sodium Saccharin, Boron Nitride, Ethylhexyl Palmitate, Polyethylene, Zinc Stearate, Phenoxyethanol, Poloxamer 338, Silica, Sodium Dehydroacetate, Sorbic Acid, Theobroma Cacao (Cocoa) Fruit Powder/Theobroma Cacao Fruit Powder, Vanillin. May Contain/Peut Contenir (+/-): Ultramarines (CI 77007), Iron Oxides (CI 77491, CI 77492, CI 77499), Manganese Violet (CI 77742). Strawberry Bon Bon Ingredients: Talc, Mica, Zinc Stearate, Ethylhexyl Palmitate, Ethylene/Acrylic Acid Copolymer, Sodium Saccharin, Boron Nitride, Aqua/Water/Eau, Phenoxyethanol, Polyethylene, Sodium Dehydroacetate, Sorbic Acid, Theobroma Cacao Fruit Powder, Vanillin, Carmine (CI 75470), Iron Oxides (CI 77491), Titanium Dioxide (CI 77891).Triple Fudge Ingredients: Talc, Mica, Ethylene/Acrylic Acid Copolymer, Zinc Stearate, Ethylhexyl Palmitate, Sodium Saccharin, Polyethylene, Aqua/Water/Eau, Boron Nitride, Phenoxyethanol, Sodium Dehydroacetate, Sorbic Acid, Theobroma Cacao Fruit Powder, Vanillin, Iron Oxides (CI 77491, CI 77492, CI 77499), Titanium Dioxide (CI 77891). White Chocolate Ingredients: Talc, Mica, Zinc Stearate, Ethylhexyl Palmitate, Sodium Saccharin, Aqua/Water/Eau, Boron Nitride, Ethylene/Acrylic Acid Copolymer, Phenoxyethanol, Polyethylene, Sodium Dehydroacetate, Sorbic Acid, Theobroma Cacao Fruit Powder, Vanillin,: Iron Oxides (CI 77491, CI 77492, CI 77499), Titanium Dioxide (CI 77891). 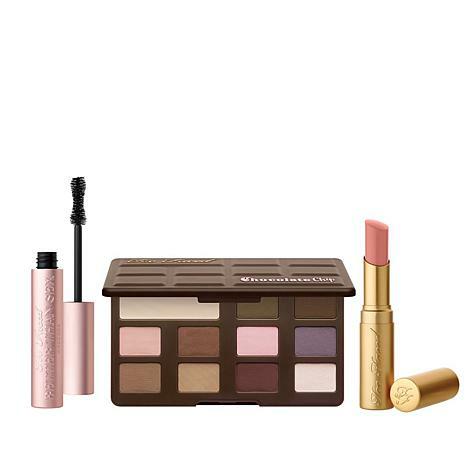 This is a great make up set. The mascara is rich & lengthens lashes without clumping. Result is individual lush lashes. 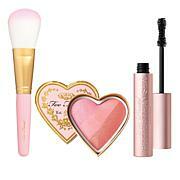 The eye shadows are perfect- lovely colors, stays on and opens eyes. (Light chocolate fragrance is luscious).The lipstick too is moisturizing& a good shade, though I prefer a bit darker color. You won't go wrong with this well thought out kit. I will buy again. I LOVE this set. The eyeshadows are nicely pigmented, and I can even use the top right one as a brow shadow and it lasts all day. The lipstick is super moist and a nice shade of pink. Nice to wear with a smoky eye.I like the mascara, it lengthens and makes your eyelashes full at the same time without clumping. Make sure you remove it before bed though! I forgot a few times and it was all over my face and a horrible pain to remove. The eyeshadow matte palette is the big prize of this trio. Rich, beautiful, colors that go on like silk. Bonus: Had no idea itd smell like chocolate! 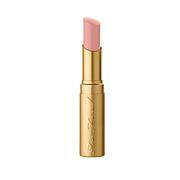 The lipstick is light peach, not a great match for my tone, but pretty and moisturizing. The mascara is fine...but like I said, its all about the eyeshadow. Great kit! I love each piece. Item is as exected and I would buy another kit in the future. Every single shade is perfect. Usually, I can only use a few and leave the others to go by the wayside. Not this palette. Perfect. Highly recommend.